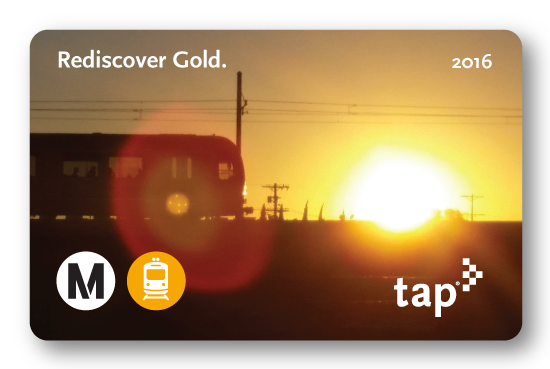 Above is a preview of a new commemorative TAP card that will be available beginning March 5, the same day the Gold Line extension to Azusa opens. The cards can be purchased at TAP vending machines at the following stations: Union Station, Sierra Madre Villa, Arcadia, Monrovia, Duarte, Irwindale, Azusa Downtown and APU/Citrus College. The cards will be available as long as supplies last. 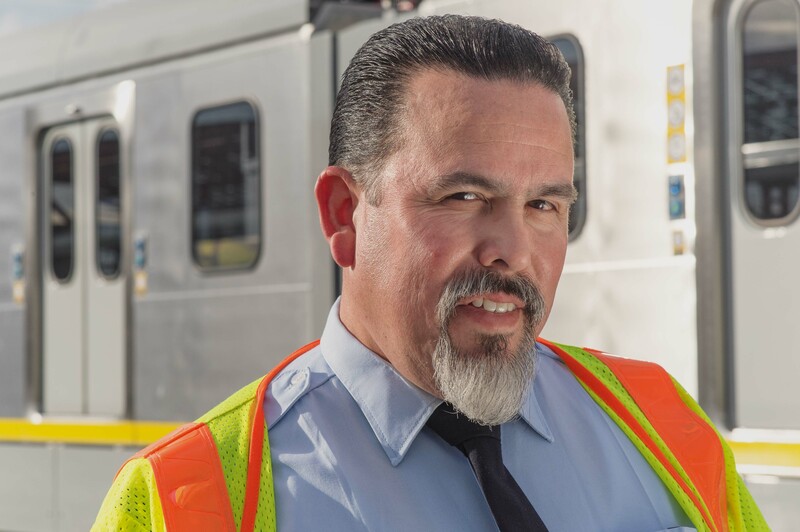 Metro Rail operator Mike Santillan, who took the photo featured on the new commemorative TAP card. Photo by Steve Hymon/Metro. The photo that appears on the card was taken by Metro Rail operator Mike Santillan. He captured the image before his shift one morning — it was taken using a smart phone camera looking east from the Gold Line maintenance yards along the Los Angeles River shortly after sunrise. Mike started with the RTD in 1990 (the RTD evolved into Metro in 1993) and was a bus operator for 14 years. He has been working on the Metro Rail program for the last dozen years and, most recently, has been helping to break in new light rail vehicles to be used on the line and prepare the extension for its March 5 opening. Excited about the Gold Line opening? Check out the new web pages on metro.net devoted to the Gold Line Foothill Extension. I have one question; can I use my senior tap car to travel to Azusa. Yes, once the extension opens March 5, you’ll be able to use your TAP card to ride the Gold Line to Azusa! However, please note that senior fare/passes may not be added to the commemorative TAP card. This is really great! Now, beginning March 5, 2016 I can visit my relatives in Azusa often without having to drive my car. Fantastic job to Mike Santillan; I plan on buying one on March 5th. On the subject of the Gold Line extension, will the first trip on the foothill extension segment run according to the timetables on opening day, or will it not be until after the opening ceremony? We’re waiting to get the schedule for the first day. I don’t think there will be a super early morning start — might be later in the day. As soon as we know for sure, I’ll post the schedule and all the events on opening day. On the web site it says “Free rides to the public start at 11am on the entire Metro Gold Line and end at midnight.” Not to get legalistic with all the disclaimers, but is this for the entire Gold Line, including the (probably still disconnected) East LA segment, and does that mean that trains will not be open to the public east of Sierra Madre Villa until 11 am? And, given that Metro Rail service continues until past 2 am, riders should assume that regular fare is required and the gates will “latch” shut without fare at the gated stops? We’re currently in the process of updating the website due to some changes made by the powers that be. But the free rides will be for the entire line, with the extension open to the public starting at noon. And yes, after midnight you will need to TAP to ride. When will the commemorative TAP card be available in machines? I want one. Thanks. They will be available at TVMS at Union Station, Sierra Madre Villa, Arcadia, Monrovia, Duarte, Irwindale, Azusa Downtown and APU/Citrus College starting March 5, available while supplies last. I plan to be at one of these stations early. You could save me one ( Smile).